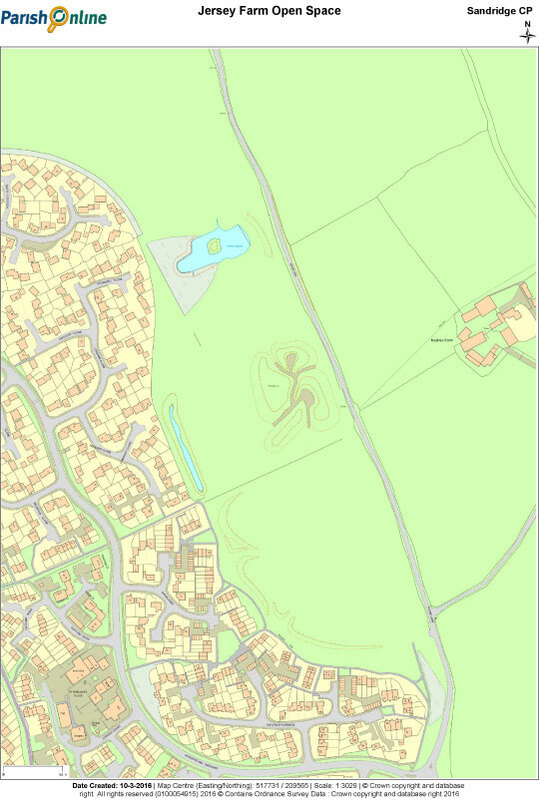 This area, the site of the Residents Association’s annual fireworks display, can be found to the south and east of the Woodland Park – see above – and divides House lane from the Jersey Farm housing. It is bisected by footpath 26 and boasts both an Adventure Play area and a lagoon, home to various wildfowl as well as sticklebacks, horned snails and other aquatic life. Having, in part, been a District Council landfill site from 1950 to 1970, and with the recent attempts to have it registered as a Village Green having failed there is currently a move to have this green and pleasant space designated as a Field in Trust and for the Parish to take it in hand. Jersey Farm Woodland Park, AL4 9LQ, is situated in Sandridge Parish in Hertfordshire and comprises 55 acres of mixed woodland and meadowland. There are five main entrances onto the Park including one which can be accessed from Jersey Lane, a popular footpath and cycleway which runs between Sandridge Village and St. Albans. Jersey Farm Woodland Park is managed by Sandridge Parish Council, who lease the land from St. Albans District Council, and a 5-yearly management plan is followed to maintain, protect and enhance the area for the local residents and wildlife. Around the perimeter of the Park runs a permissive bridleway and a network of informal paths cross the meadowland making it an ideal place for both ramblers and dog walkers who can enjoy the peaceful atmosphere and the views over the Sandridge countryside. Benches, including ones affording views over the picturesque St. Leonards Church, are strategically positioned. Over 10,000 native trees have been planted on the Jersey Farm Woodland Park along with many grasses and wild flowers – Skylarks can be found nesting in the meadowland over the Summer months and a variety of flora and fauna have made the Park their home. Regular taskforce volunteer days are held on the Jersey Farm Woodland Park together with a number of guided walks which help to involve the local residents in the maintenance of the Park and to raise awareness about wildlife in general. A memorial to the Burma Star Association is situated by the Chiltern Road entrance onto the Park. Click here to download a printable map of the Woodland Park. 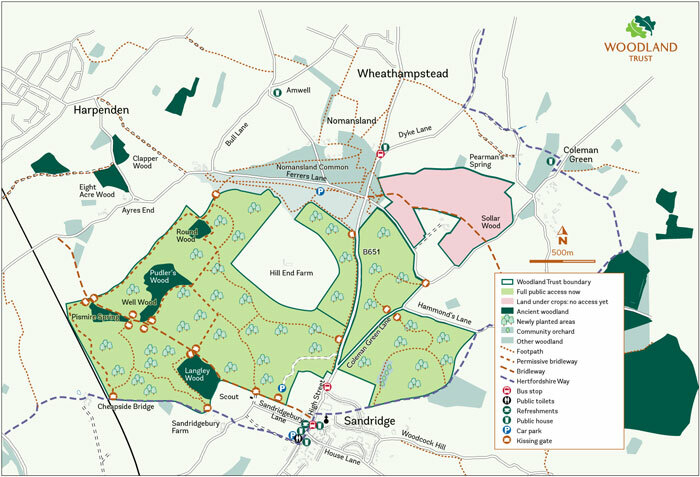 Heartwood, which is owned by the Woodland Trust but provides free access for all, covers some 345 hectares (858 acres) to the north of Sandridge village and has a car park approached by a signposted track from the B651 Wheathampstead road. The forest, which includes large swathes of wildflower meadow together with four areas of ancient woodland, will encompass some 600,000 new native deciduous trees, all planted by volunteers. In addition, a Community Orchard has been created by local schoolchildren and an arboretum focused on useful timbers has also been planted. A wonderful asset, attracting visitors from afar as well as horse riders and dog walkers locally, the development of the forest has also seen a remarkable increase in the amount of wildlife in the area. From buzzards, owls and red kites overhead to numerous varieties of small mammals and insects at ground level, the variety of species are being routinely monitored by specialist volunteer groups. For more information on Heartwood Forest please click here. Please click on the map opposite for a larger version. 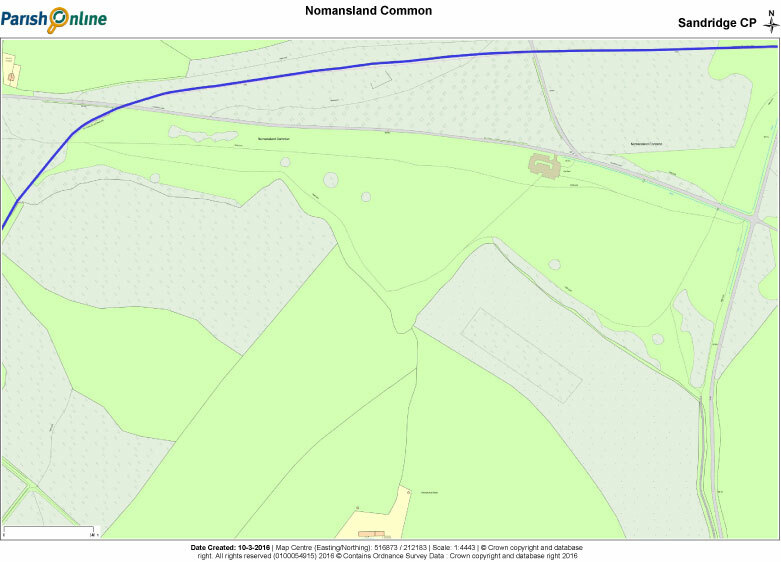 Nomansland covers 52.5 hectares (130 acres) of open space owned jointly by the Althrop Estate and Wheathampstead Parish Council and sits astride both the B651 road to Wheathampstead and Ferrers lane. There’s a car park alongside Ferrers lane, almost opposite Down Green lane. Having been the site of a glacial lake in the last ice age and Iron Age habitation thereafter, it has hosted such diverse events as inter-monastic strife, the final stage of the Second Battle of St Alban’s, bare knuckle prize fighting and horse racing. Along with the presence of a notorious Highwaywoman (Lady Katherine Ferrers) and the hoard of Roman gold coins the Common doesn’t lack history. Today it is a popular space for dog walking, horse riding and, over the permitted zone, flying model aircraft. Ranging from a wooded area on the northern flank through heathland to a wild flower area on the southern side, and with Heartwood Forest as neighbour, this is a delightful open space, rich in wildlife, for all to enjoy.